In the words of Miele’s founding fathers, Carl Miele and Reinhard Zinkann, “Success is only possible in the long term if one is totally and utterly convinced of the quality of one’s products.” Therefore, continuous innovation is the foundation of our business success. S5 vacuum cleaners are manufactured at Miele’s Bielefeld factory in Germany where every effort is made to embrace the company’s 107-year motto of Immer Besser or Forever Better. Endurance testing in custom-built laboratories forms an intrinsic part of quality assurance on all Miele vacuum cleaners. Before any production process begins, all components are put through rigorous tests and subjected to enormous strain’ stress that exceeds typical residential household use. In fact, every unit is put through a final quality test, not just one in every hundred or two per production run, ensuring that your home is not a testing ground. Only when all components, electronics and floor tools have successfully passed each critical exam will the Miele brand name be bestowed on them. The three smooth-running 360° castor wheels mounted on steel axles ensure maximum stability and maneuverability for your vacuum cleaner. They are cleverly designed with a travel ramp to help you maneuver your vacuum easily over thresholds and around obstructions. The S5 is fitted with an extra long cable to avoid the need of having to change sockets halfway through vacuuming. Together with the hose and suction tube, you have an operating radius of 29½ feet. The power setting on the new S5 can be adjusted on six levels, depending on the type of flooring you’re cleaning or surface you’re dusting. Easy to understand graphic symbols indicate which setting is best suited for different kinds of surfaces, such as rugs and carpets, drapes or hard floors. On select models, the power levels are back-lit, making it easier to find the right setting. Miele vacuum cleaners are instantly identifiable by their unique design and stylish character. Careful attention is paid to every curve, angle and line ensuring that the only thing rivaling the vacuum’s beauty is its functionality. Skillfully crafted to provide easy operation, effortless movement and remarkable efficiency ‘ Miele’s beauty is far more than skin deep. Intelligent automatic setting When the automatic setting is selected, the power level of the vacuum cleaner adjusts automatically to suit the floor surface currently being cleaned and ensures the most economical use of energy. And because the guesswork has been eliminated, there is no need for you to adjust the power level yourself. All Miele vacuums are known for their quiet operation, but a special sound insulation makes the S5 particularly quiet. The new silence setting combines the lowest noise output with the ideal power level for optimum cleaning results. For short breaks, the wand and floor tool can simply be inserted into the park system on the back of the barrel. This allows you to answer the door or the telephone without having to find an unsafe resting place for the wand or laying it on the floor. On selected models, the park system also switches off the motor, saving you time when you are interrupted. For safe storage and easy transportation, two fittings allow the telescopic wand assembly to be hooked onto the barrel when it is upright one on either side. So no matter whether you are right-handed or left-handed, the S5 offers you an ideal solution. If you need to carry the vacuum cleaner up and down stairs, you will have the other hand free to hold on to the railing. The fully integrated bumper strip made from soft plastic goes all the way around the vacuum to protect both furniture and the vacuum in the event of a collision. features a neat, on-board storage compartment. A crevice nozzle for hard to reach corners, an upholstery tool for all those crumbs on the couch and a dusting brush for the cobwebs in the corners are always on hand, whenever you need them. A significant benefit of the Miele S7 is its innovative, patented SwivelNeckTM which allows steering in all directions. The SwivelNeck™ is so maneuverable the S7 can even be laid flat to the floorwhich makes getting under beds andother low furnishings easier than ever before. 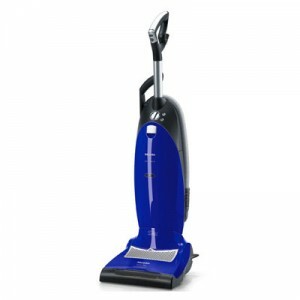 Using the foot switch, the casing is disengaged from the floor head and the rear wheels disappear into the body of the vacuum enhancing overall maneuverability without exertion on your body. Movements are fluid, natural and almost effortless. The other key to nimbleness is smooth running front caster wheels that rotate 360-degrees and have non-marring rubber wheels that protect hard, smooth surfaces like tile and wood flooring. The S7 negotiates obstacles with incredible ease and reaches into inaccessible places… between tables, chairs and under chairs. 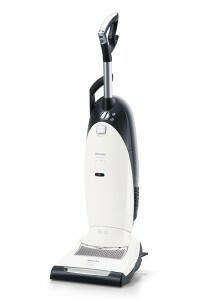 Unlike other vacuum concepts, the Miele S7 provides this maximum agility without making you carry the weight. 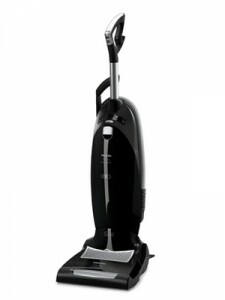 Thanks to superior engineering, when the vacuum is reclined, the majority of weight is carried by the base electrobrush assembly making it easy to hold and remarkably easy to push. Moving from hard flooring to carpeting? No problem. The floor switch raises the electrobrush making it smooth to jump from one surface to another. The electrobrush can be turned off, stopping the agitator bar, letting the suction power do all of the heavy lifting. Scratch sensitive furniture and decorative moldings are best cleaned using the dusting brush. Thanks to its soft bristles, this accessory is thorough yet gentle. The extra-long crevice nozzle is just the right tool to clean narrow, hard-to- reach nooks and crannies…like between sofa cushions, leaving no hiding places for even the smallest of crumbs. A large upholstery brush is the final on-board accessory and lets you quickly groom sofa and chair cushions…its exceptional when tackling pet hair and other debris. All accessories fit the handle and the telescopic suction wand. And, because motor power can be regulated, delicate surfaces and fabrics such as curtains and lamp shades can easily be cleaned. Of course, the super-long power cord provides the ultimate convenience… vacuuming Without inconvenient interruptions to switch power outlets. 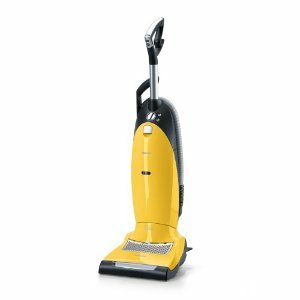 The S7 is equipped with a 39-foot long cord and together with its flexible suction hose and telescopic wand, offers a massive radius…an amazingly convenient cleaning reach! The primary cleaning force behind any vacuum cleaner is its suction motor. As with all Miele floor care products, the S7 is equipped with a strong 1,200 watt Miele-made Vortex Motor System™. Our system guarantees optimal airflow and is designed to Miele’s 20-year life design protocol. And, despite its power, the Vortex Motor System™ is remarkably quiet. Vacuuming in peace for decades… that’s S7 by Miele. Thorough yet gentle cleaning of deep pile carpeting even when the depth of pile varies. This is why Miele S7 offers an innovative automatic height adjustment feature. The key component is the electrobrush. The electrobrush has a unique roller brush assembly (the roller brush is the agitator bar that, when spinning, separates carpet fibers following the suction power of the vacuum to lift dust and debris lodged deep down in the carpeting) which is flexible and spring-loaded to adapt to different carpet heights and floor coverings. The electrobrush follows the contour of the floor, reaching dust particles found in the depths of deep pile carpeting while the floor head always maintains optimal surface contact allowing consistent air flow. The height adjustment on Miele’s S7 is truly automatic requiring absolutely no manual intervention. 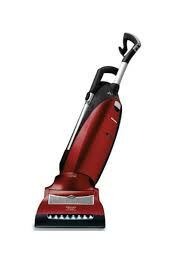 Miele S7 is gentle on your carpets, penetrating the pile only to the depth necessary. And thanks to its own powerful 4,800 RPM motor, the roller brush can be turned on and off separately allowing quick transitions to or from smooth flooring to carpeting. Gentle cleaning at the highest level. When the automatic motor control setting is engaged, on select models, the power level of the vacuum cleaner adjusts automatically to suit the surface currently being cleaned and ensures the most thorough results. And because the guesswork has been eliminated, there is no need for you to adjust the power level yourself… now that’s technology working for you! a selection of high-quality filter cartridges, including a certified HEPA filter (standard with every S7 vacuum). We, at Miele, recommend that you exercise caution when evaluating other vacuum filtration systems, as there are many gimmicks that do not work as effectively or scientifically. As this is an area where the results can be devastating to young or elderly lungs, or to anyone who suffers from allergies or asthma, you may want to visit a local authorized Miele dealer to discuss the importance of the indoor air quality in your home and how a Miele S7 vacuum cleaner can not only protect it, but also improve it. Miele has been producing floor care products renowned for their quality and durability for over 80 years. Now with more than a million vacuums leaving its Bielefeld, Germany plant each year, Miele is the largest family owned and operated floor care manufacturer in the world. One reason for Miele’s excellent product quality is the use of intelligent technology ensuring precise and rational production. Another reason is the close proximity between production and quality control engineering. Key components are not simply purchased on the open market, they are developed and produced by Miele. They must be. Miele’s legendary 20-year life design mandates the strictest quality control levels that adhere to a 110 year pledge of Immer Besser (or Forever Better). A high quality, world class product takes shape in the hands of skilled line workers at Miele. With care, concentration and respectful attention to detail, each S7 vacuum cleaner is crafted.